Teaching estimation can be tricky for some children, especially grasping and accepting the uncertainty inherent in estimating. These books can help! After years of learning that math is black and white--"correct or incorrect"--estimation requires a mind-shift that some kids have a hard time making. Some kids don't understand why they can't just count the items (since that's their comfort zone). Then, there's the other side of the spectrum--kids who are a little too free with throwing out any old random number when estimating. :) But...both types of kids need to overcome these tendencies because the ability to estimate is an essential building block for so much of math in the upper grades. The following children's books can go a long way in helping children grasp this concept and develop this very important skill. 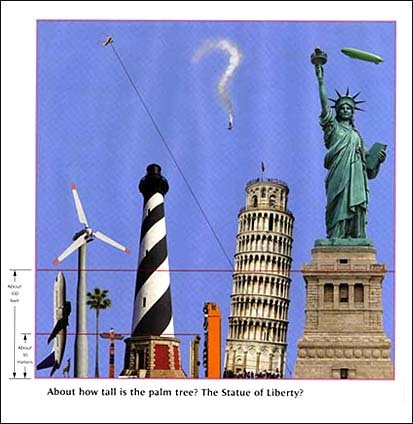 (2nd grade - 5th grade) If you are looking for one book for teaching estimation, get this one! 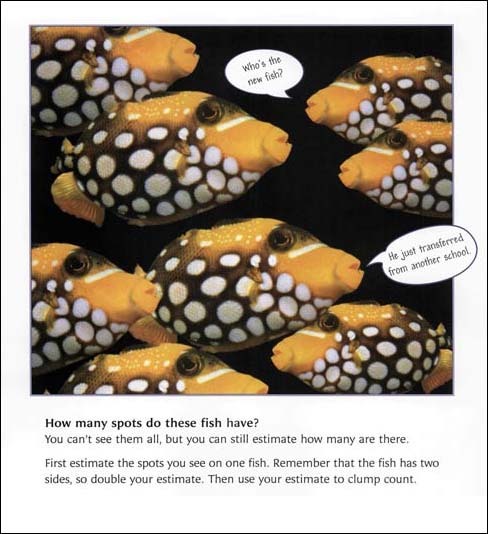 It's a visually stunning book that makes teaching estimation fun and interesting. In the book, the left side of most spreads shows crisp photographs of objects in groupings of 10s, 100s, and 1000s. The right side then shows the same objects in an unidentified amount, leading readers to see how to use groupings when estimating. School Library Journal promises "this well-designed book will add zing to many a math lesson." A Bank Street Children's Book of the Year! Below are sample pages from inside these books. In the spread, readers are invited to estimate the number of jelly beans using clump counting or box and count. Hints are provided. On the right, readers are again invited to estimate the jelly beans using the suggested method of estimating the 'first layer' (smaller image) and then estimate how many layers there are. (2nd grade - 5th grade) This sequel uses the same format of eye-catching photographs and groupings of objects, but adds estimating length, weight, area, and volume. Different methods are discussed (clump counting, 'box and count') and clear explanations of how to achieve answers are given. This is another winner for teaching estimation! In their review, School Library Journal applauded the "appealing layout that lends itself equally well to browsing or curriculum support." 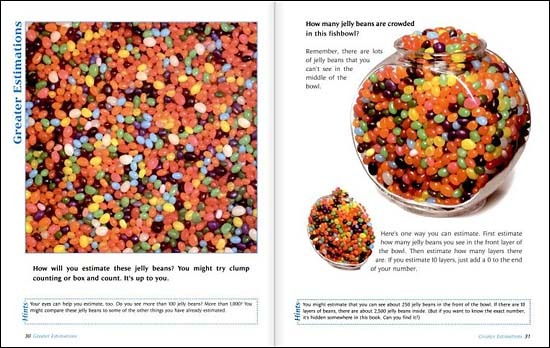 (2nd grade - 4th grade) En route to a jellybean contest, two friends face a number of scenarios that illustrate the benefit of estimating over counting. 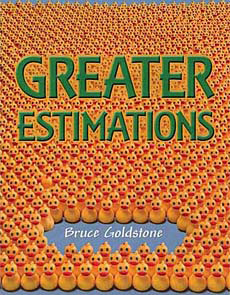 This book helps show why estimation is sometimes a better way to go than simply counting. A section at the end includes a suggestions for extension activities. School Library Journal called it "especially useful for classroom use as it provides many possibilities for related activities" for teaching estimation. This book is part of the popular MathStart series of math picture books for kids. Below are sample spreads from inside this book. In these spreads, the boys read about the contest, and then head down to the store where it is taking place. En route and when at the store, they use estimation for various activities. In this second sample spread, the boys set up an estimation activity related to how many people are on the bus. This and other activities teach that sometimes it's more appropriate to estimate than to count. 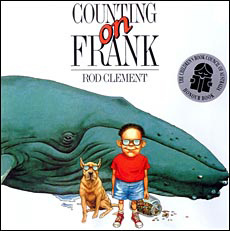 (1st grade - 4th grade) Counting on Frank tells the story of a curious little boy named Frank, who likes to ask questions and ponder 'what if' scenarios, then investigate the answers with math.He measures how long his pen writes before it runs out of ink. He estimates how many dogs would fit in his bath and how many whales would fit in his house. He calculates how tall he he'd be if he grew as fast as a tree... Frank is a font of curiosity and his enthusiasm is contagious! This book captures the endless curiosity of children, adding a distinct math flair. Each of Frank's scenarios could easily be turned into a classroom activity, plus there's a section at the end is full of additional questions like those posed by Frank. We don't love the illustrations. Frank's a bit odd looking-- sort of like a little man child. However, the illustrations are comical and keep the overall tone light. Overall...we really like Counting on Frank. Kids can't help but catch a little of Frank's curiosity and problem solving leanings. And that's priceless in our book! 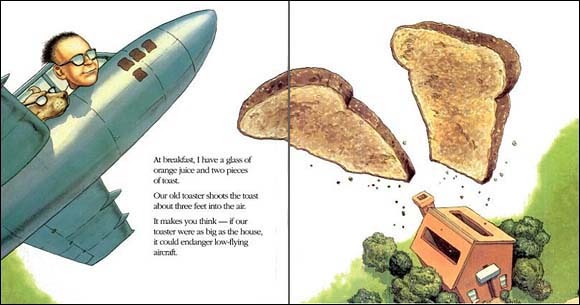 On this first sample spread, the text reads "At breakfast, I have a glass of orange juice and two pieces toast. Our old toaster shoots the toast about three feet into the air. It makes you think -- if our toaster were as big as the house, it could endanger low flying aircraft." The book is full of similar fun comparisons, mathematical wonderings, etc. And Frank's curiosity is contagious! 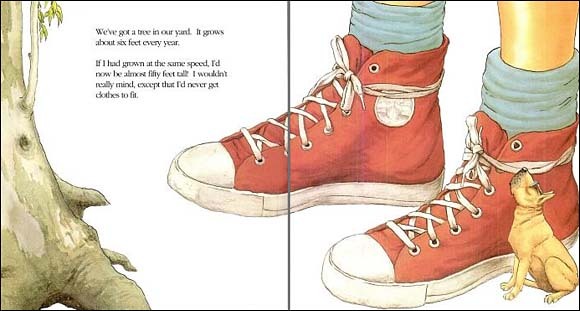 The next sample spread shows how tall Frank would grow if he grew as quickly as a tree in his yard. The book is full of intriguing ratio and measurement activities like these---excellent fodder for classroom and homework activities. 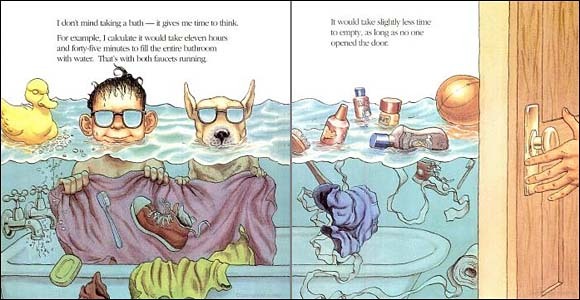 Lastly, this spread shows Frank pondering how long it would take to fill up the entire bathroom rather than just the tub. This will be harder to turn into a direct math problem :) but does show how mathematical curiosity can be a lot of fun! 5. How Many Seeds in a Pumpkin? (Kindergarten - 1st grade) This is a cute children's book to use when teaching estimation because it's a book version of the popular classroom activity--the estimation jar. 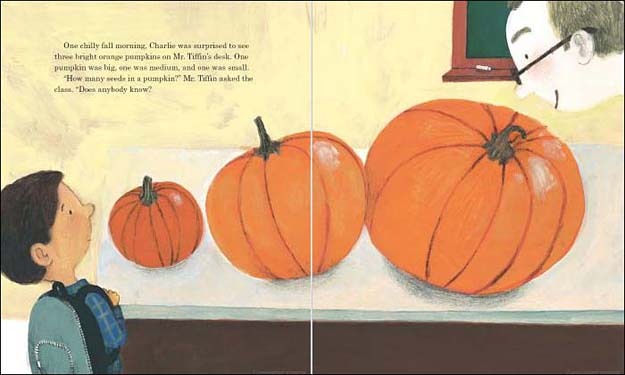 In the story, the 'jar' is a pumpkin, and the students are to guess how many seeds are inside. 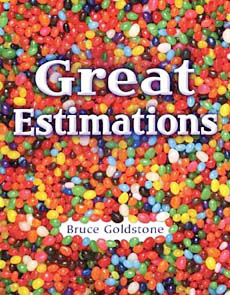 This book is a fun way to introduce estimating--and even the estimation jar activity. 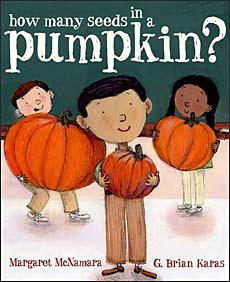 Early grades teachers will also like that this book covers counting by 2s, 5s, and 10s...and has interesting pumpkin facts to boot! Booklist said "this versatile and sincere story will teach math and science concepts while modeling kind behavior." 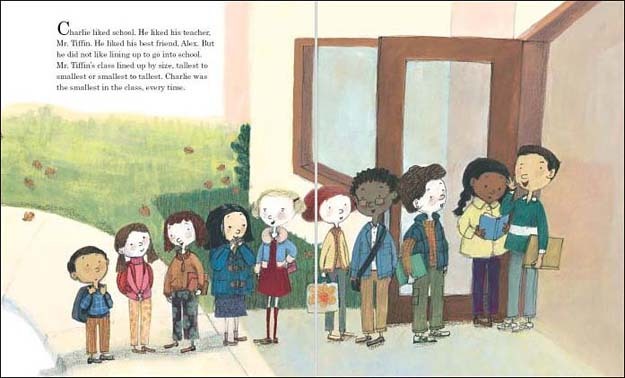 Karas's darling illustrations are our favorite part! This title won the Christopher Award Winner in 2007! 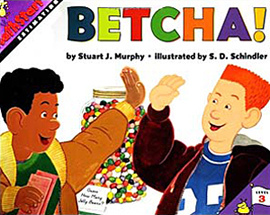 Do you any other books for teaching estimation? Obviously, we haven't found very many children's books for teaching estimation, which is a shame because this is definitely a topic that needs lots of examples before it really sinks in with kids. We really need more good books in this category but we search as we may, we just can't find others. Do you know of a good children's book for teaching this topic? If so, please spread the word so we can review it! You can lets is know by clicking here.